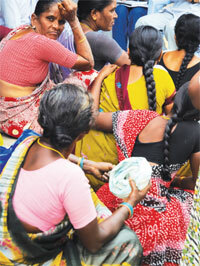 Fifty-four suicides in Andhra Pradesh have blown the lid off the social posturing by microfinance companies. Before the news of the deaths sank in, the country feted Vikram Akula, head of SKS Micro-finance, as the new messiah of microcredit. A 273 per cent growth in loan disbursement and returns to investors made him a national hero. India’s micro-finance institutions claim they followed the fabled Grameen Bank model of Bangla­desh. In reality, they went against its principles. And the government did not do enough; regulations are fleeting and they don’t touch where it hurts most: the high interest rates. 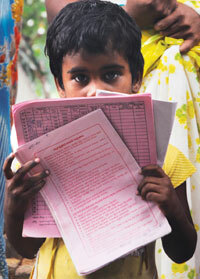 Ega Mounika was born into debt, lived in debt and died with debts. The college-going 20-year-old of Warangal’s Karimabad village immolated herself on September 25; three days later, she died. “My daughter wanted to release us from debt,” said her father Laxmi Narayan who sustained burn injuries trying to rescue her. He owns a paan shop and always had debts, which is why no bank found him worthy of a loan. So five years ago, when a microfinance institution (MFI) approached her mother, a beedi roller, offering a loan of Rs 10,000, Mounika was quick to say yes. She bought a sewing machine with the money, started a tailoring business, dividing her time between studies and the new machine. “Things were fine for two weeks,” said Narayan, “then we began to default.” Loan repayment is usually weekly in microfinance. That was how the family entered a labyrinth of debts; nobody knew the way out. They borrowed afresh to pay off old debts and sank deeper. The only way they could avoid default was by taking yet another loan. “We took four loans worth Rs 80,000 from four different companies,” Narayan said. But that was hardly a solution. The family earned Rs 4,500 a month and had to repay loan installments of Rs 10,000 a month. With five loans on their head, Mounika’s family had a loan installment to repay almost every day. Then there were the three emergency loans of Rs 5,000 from moneylenders at 120 per cent interest in the past three years. Every day for five years, MFI collection agents would come to their house and get rough. 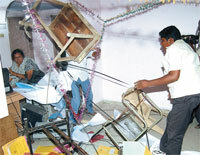 “There was no peace any more, the family was ruined,” Narayan said. On September 25, the collection agents told Mounika’s mother, sell your daughter to the flesh trade and repay. Mounika chose to die. Even before the family could come out of shock, the agents were back at their door. When Narayan asked for time, they refused saying the business model of microfinance companies does not allow that. Had the borrower committed suicide, in this case Mounika’s mother, the lending company could have claimed the sum from the insurance company as all loans are insured. No wonder, people have alleged MFI agents abet suicide (see ‘How the noose tightens’,). Some 20 km away, Mohammad Saif of Jawahar Colony feels lucky. His mother attempted suicide on October 20 but survived. She got loans worth Rs 2 lakh from four companies. But even after paying for over 400 weeks, the outstanding amount is around Rs 1.5 lakh. Saif said he sold his autorickshaw; the small hotel they ran is shut down. In 2006, his mother along with 13 other women in the neighbourhood, had formed a self-help group (SHG). Under the state government’s Indira Kranthi Patham programme—linking SHGs to banks for loans based on group savings—they saved money every month for a year to get a bank loan. Only three women got a loan from the SHG as regulations stipulate revolving loans. A year of saving and ensuring that everybody complies took time. “I withdrew. 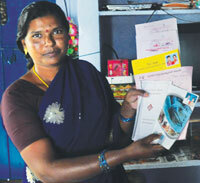 Then a microfinance company came to my doorstep and gave me Rs 14,000,” said Sarojini Rathipilli, a resident. She set up a sari shop but with a sale of one sari in three or four days, she had to take another loan to repay the first one. In four years she accumulated four loans and weekly repayment that was 10 times her earning. “Repayment takes away everything, even the business set up with MFI loans,” said Matapalli Radhika, a borrower. No business started with loans from MFIs has survived in Jawahar Colony, where almost every family has taken a loan. Now as they try to revive the SHG, the past default doesn’t qualify them to access loan from a bank. The alternative: moneylenders. Village after village in Warangal only confirms that the rural credit business has undergone a suicidal makeover. There is great need for credit that is in short supply from benign sources like public sector banks. It becomes clear that every borrower from a microfinance company has suffered acutely because of the failures of other public credit programmes. Bhagyalaxmi Mahila Multi-aided Cooperative Society in Enugallu village in Warangal’s Parbutagiri block has a public credit programme that has not failed its borrowers. It has several SHGs as members and gets loans from nationalised banks showing group savings. The repayment rate has been encouraging at 80 per cent. The cooperative society, unlike microfinance companies, distributes profits among members; this year it gave a dividend totalling Rs 3 lakh and set aside Rs 5 lakh as revolving fund to attract more bank loans. “The 15 per cent interest is heaven compared to 36 per cent of the MFIs,” said Turi Laxmi, president of the cooperative. Banks have suddenly stopped loans to the cooperative; they lend directly to SHGs. Bhagyalaxmi is an innovation. It has been recommended by many high-level government panels on rural credit. “The average loan amount with an SHG is not adequate. But banks refuse to recognise us,” said T Yugandhar of Sanghatitha Mahila MACS Federation, Andhra Pradesh, the apex body of such cooperative societies with over 2,174 SHGs as members. The cooperative got its last bank loan in April 2008. “Without immediate loans we will not be able lend to the rural poor. This obviously leaves space for MFIs to capture,” he said. Warangal’s story repeats itself in And­hra’s 22 other districts; it is constricted by a rural credit crisis. Around 75 per cent of India’s MFIs are located here. The current crisis in Andhra Pradesh is the rural Indian version of the subprime crisis in the US in 2006. It started at the same time and with a similar unsustainable model of credit that involved high risk and high profit. In subprime lending, organisations give loans to people with poor credit worthiness. In the US, subprime lured many to multiple loans. But these loans had mortgages like the house or the car borrowers bought with the loan. MFIs adopted the same model but without a collateral. In the US lending companies took the hit while in Andhra Pradesh borrowers were crushed. According to information submitted by MFIs on October 29 to the state government, 50 per cent of rural poor households in the state have taken multiple loans. The interest rate ranges from 21.2 per cent to 60.5 per cent. Down To Earth accessed these MFI submissions and found more than 80 per cent borrowers are from non-farm sectors. The majority of the rural poor sought loans to sell vegetables, run a dairy or do scrap and steel business. MFIs lend close to Rs 200 crore every week to non-farmers. According to a confidential report prepared by the Society for Elimination of Rural Poverty (SERP), state government body linking SHGs with banks for credits, of the 54 suicides in the state recently, allegedly due to harassment by MFI agents, 45 were by landless. “Most MFI borrowers are landless. And unlike the last spate of farmer suicides five years ago, mostly non-farmer and first time borrowers died in the current wave,” said Narasimha Reddy, journalist with Eenadu. A survey found that only three per cent of rural borrowers were confident of getting a bank loan. Thus the SHG-bank linkage is a bonanza. Women first save—usually Rs 30-40 a month per member in a group of 14—for close to a year. The banks treat the savings as the collateral and lend an equal amount or more at 14-15 per cent interest. The SHG re-lends at around 16-24 per cent interest after assessing the borrower’s ability to pay back. Since 2006, under the Pavalla Wadi scheme SHG members pay an interest of three per cent while the state government bears the rest. The state has the country’s largest number of micro-credit groups—975,362 SHGs with 11 million members. The number of SHGs has increased 10 times in the past decade covering almost 90 per cent of the state’s rural women. An impact assessment by the Centre for Economic and Social Studies in Hyderabad, published in May this year, shows that while the micro-credit did help many, the sum was grossly inadequate. It found SHG members sourced 71 per cent of their credit demand from informal sources (read, moneylenders and relatives with interest rates ranging from 60 to 120 per cent). Around 100,000 SHGs are yet to be linked to banks and thus to credit. “This probably explains why nationalised banks are lending less to SHGs and doing bulk lending to MFIs. This has been the trend since 2005,” said Kurapati Venkatanarayana, professor of economics with Kakatiya University, Warangal. Another problem is the 12 per cent subsidy on interest. People pay the 15 per cent interest to the bank; after it certifies the SHG has repaid all loans, the government directly reimburses the 12 per cent in the SHG account. But there is a catch. “Banks delay the certification and it takes one to two years for the subsidy money to come through,” said Rama Jyothi, an independent observer. Time is another factor. It takes an SHG three to four months to get a bank loan and another month to disburse. “Many banks don’t allow SHGs to lend their savings. This brings down the credit available,” admitted B Rajsekhar, chief executive officer of SERP. Given this widening gap in supply people turn to MFIs for credit. “These companies tapped into an organised captive market,” said Vijay Mahajan, president of the Microfinance Institutions Network (MFIN), a self-regulatory body of for-profit MFIs. An MFI loan is with the borrower in three days. With no collaterals there are two ways to ensure repayment: form a joint liability group (JLG); if one member defaults the group is responsible. The other is coercion. An MFI collection agent gets around 55 per cent of his salary as incentive if collection meets the target. Close to 80 per cent of SHG members have taken MFI loans. Andhra Pradesh is a pointer to the future. As MFIs scale up in the rest of India they will most likely deliver similar distress on a wider scale. The total demand for micro-credit in the country has been estimated at Rs 50,000 crore. The Reserve Bank of India (RBI) estimates that in 256 of India’s 626 districts the credit gap is at least 95 per cent or more. Most mfis are concentrated in these districts, including two of the country’s largest—Spandana Spoorthy Innovative Financial Services Limited and Swayam Krishi Sangam (SKS) Microfinance. The poster boy of MFIs, SKS is often lauded in microfinance conferences around the world. A not-for-profit MFI, it turned around, shed its inhibitions and became a for-profit, non-banking financial company and overnight acquired a million clients. According to statistics maintained by Micro-finance Information Exchange, Inc (Mixmarket), a non-profit business information provider in Washington DC, usa, from a handful of borrowers in 1998, when SKS started as a non-profit, it grew to have 5.8 million borrowers in 2009, making it India’s biggest MFI. The company website claims in 2010, SKS had 7.8 million borrowers. This dramatic rise has meant that the drift of microfinance is changing from social uplift to moneymaking. About 80 per cent of the total loans given out through MFI channels are by commercial NBFCs like Span­dana and SKS (see ‘Credit portfolio’). Microfinance for the rural poor began when NABARD (National Agriculture Bank for Rural Development) initiated a pilot project in 1992 with about 500 women’s SHGs across the country. This was called the SHG-bank linkage programme (SBLP). It was slow to start off. “It took 12 years for the first one million SHGs to be linked to formal credit,” said Vipin Sharma of Access Development Services, a Delhi non-profit providing technical support to the microfinance industry. Sharma said that the next one million was added in about 24 months. It was slow because due diligence was ensured before giving credit. The SHG- bank linkage programme still has the highest volumes in the country. SHGs are considered safer as lending is conditional to saving. Group saving is mostly used for productive purposes. In the case of MFIs it is only lending. MFIs got into big lending in 2005-2006. Figures NABARD released show that till 2009, the outstanding SHG loans amounted to about Rs 23,000 crore, about twice the size of the MFI portfolio. But a report by Intellcap, a New Delhi consultancy group working in the social sector, said the MFI yearly disbursement overtook SHGs in 2007. Between 2006 and 2009 MFIs had 83 per cent annual compounded growth rate while that of SHGs during the same period was 41 per cent (see ‘Loans disbursed’). Till the middle of this decade, there was only one for-profit microfinance organisation and about eight to 10 not-for-profit MFIs. According to a sidbi (Small Industries Development Bank of India) official, today’s big MFIs started as non-for-profit entities. “India’s two largest, SKS and Spandana Microfinance, both of Hyderabad, also started as non-profits. Later they turned into for-profit NBFCs,” the official said. Mixmarket reports that SKS started in 1998 with some 19 borrowers and till 2004 added 74,000. Spandana did better, from about 500 clients it reached about 386,000 in the same period. But they were small compared to Grameen Bank of Bangladesh, which had some 3.7 million members in 2004 (see below ‘The Grameen model’). Around 2005-2006 MFIs began changing their stripes. They scurried to tap commercial markets and venture finances avowedly to ensure a wider credit net for the poor. Vikram Akula, founder of SKS, in a debate organised by the Clinton Global Foundation in September 2010, argued, “How do you design microfinance in a way so you don’t say no (to people who need credit)? By accessing capital markets and yes, commercial microfinance is an important tool for inclusive access.” He said this while arguing with Muhammad Yunus, founder of Grameen Bank and Nobel Prize winner, who discourages venture capitalists funding MFIs. Akula’s statement echoes the majority view in the Indian microfinance market, including Vijay Mahajan of MFI Network who says that not accessing capital markets would have stunted growth. “The MFI model is the third attempt to reach the poor. The first one involved the moneylenders, the second, SHGs. According to a National Sample Survey Organisation survey of 2004-05, only 27 per cent of people in villages had access to formal credit,” Mahajan said. Both Akula and Mahajan agree that the only way to attract investors is to show them that the poor are creditworthy and can return a profit. After economic liberalisation in 1991, a number of private banks emerged. “They had no effective infrastructure or resources to reach out to what would constitute the priority sector lending. They started to look at intermediate channels,” said Sharma. Private banks, particularly ICICI Bank, began innovating to lend to a group of people who in some manner represented the highest returns after taking into account various risks. It introduced the partnership model where MFIs became an intermediary, servicing clients on behalf of the bank. ICICI worked with more than 30 MFIs in India accounting for outstanding loans of approximately US $55 million in December 2004, Bindu Ananth a former ICICI microfinancier and now Institute for Financial Management and Research Trust president, wrote in Small Enterprise Development Journal. ICICI Bank’s annual report states Rs 34.17 billion was disbursed through micro-credit to about four million households in 2009. Industry reports suggest this helped MFIs to grow by 70 to 80 per cent. Partnership was a quick way of getting funds without any risk. According to Mahajan under this model, which is seldom used now, certain MFIs grew 10 times. It gave them capital to attract equity from private investors. Most big MFIs have private equity infused into them post-2006. This was the next stage of growth for MFIs. From 75,000 in 2004 SKS touched 1.6 million customers in 2007. Spandana too increased about fourfold to reach 1.19 million people. Money from the market has led to dangerous competition. The top five MFIs of the country grew at close to 140 per cent in loan disbursal between 2008 and 2009. SKS and Spandana distributed 214 per cent more money in 2009 than in the preceding year. Their client base increased at 87 per cent and 104 per cent. Private equity funds did not enter Indian MFI till about 2007-08. Till then most of the equity that came in was from companies such as Bellwhether, Blue Orchard, Lok Capital, all microfinance focused funds and venture capitalists. But the end of 2008 saw a new batch of microfinance equity providers with no history of investing in this sector. The Access report suggests that about five different deals worth more than US $80 million were conducted during the third quarter of 2008. These companies included Legatum, Sequoia and Sandstone. According to industry reports, SKS has been the biggest beneficiary getting about Rs 136 crore from these three companies. MFIs are valued globally at about 1.4 to 1.9 times their profits. But in India, MFIs could attract equity three to four times their book value. With over 600 million people in India still without proper credit channels combined with high growth rates of customer bases, most of these MFIs recorded exponential growth. Indian MFIs were returning back Rs 20 to Rs 30 for every Rs 100 invested in them. To keep their investors happy and attract more investments, the MFIs had to expand in scale. To continue high profitablity the MFIs did not lower their interest rates. SHGs lend at about 15 per cent. But MFIs may charge two to three times. According to industry sources, banks lend to MFIs at about 12 per cent interest and six to eight per cent is spent delivering the loan. But the companies used to charge as high as 60 per cent from borrowers. The RBI does not want to cap interest rates in NBFCs. MFIs say that capping the interest would make the trade unviable, restricting credit flow to the poor. Immediately after the Andhra government ordinance, finance minister Pranab Mukherjee requested the state government withdraw such capping provisions. The easiest way to increase scale was to give multiple loans. 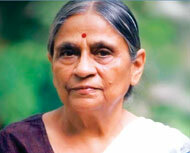 MFIs have begun lending without verifying the repayment ability or assessing the number of loans the borrower already has, said Sewa Bank founder Ela Bhatt. When the SHG programme started, loans were distributed to increase the family’s income, said Bhatt. But now it has become just a business, she added. K Natarajan, programme manager of New Delhi’s Sa-Dhan, an association of MFIs, said easy availability of loans is a problem, but added MFIs give quality service and variety of loans to suit customers needs. “Often loans from SHGs are not enough, that is when they go in for more loans,” he said. Loans to SHGs are linked with their corresponding savings, they are smaller than MFI loans, he said. A report published by Sa-Dhan in 2009 said, the average loan from an SHG was of Rs 3,800; a typical MFI loan was of Rs 6,500. When MFIs started operating in the country, they followed a joint liability pressure structure like that of the SHGs but in this case the women’s groups were smaller—about five to eight. In case the women failed to pay a weekly installment others in the group had to make up for the lapse. Although most of the lendings are still to groups, new data shows that individual lending has also begun in tiny amounts, about one per cent of their total portfolio. 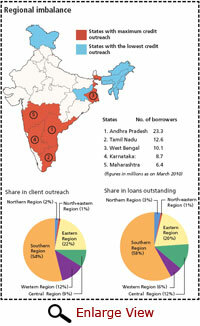 Karnataka, Kerala, Tamil Nadu and Andhra Pradesh led the market in terms of loans outstanding and clients. Of these Andhra has the maximum number of borrowers. In Warangal, where several suicides were reported, there are about 17 well known MFIs working; in Karnataka’s Kolar district, where borrowers refused to return loans in 2008, about eight MFIs are active. The rest of India, particularly northern and northeastern regions, have low penetration; about three per cent and one per cent each (see ‘Regional imbalance’,). In Tamil Nadu the government has spent substantial resources and time on preparing SHGs to use the credit in a productive way. “The savings component must be emphasised to avoid repayment crisis like in Andhra Pradesh. This means a poor creditor should be treated as a productive investment rather than a mere customer,” said Kalpana Sankar, chief executive of Hand-in-hand, a major micro-credit, non-profit organisation in Chennai. The poor need security, both economic and social. Microfinance was a tool to achieve this. But two decades later, this tool has malfunctioned with disastrous effect. The commercial MFIs’ race to make profits has overshadowed its noble beginning, plunging the poor into a death trap. Regulations are key to this sector. RBI, the apex regulator, has little control over them, especially on contentious issues like lending rates, recovery process and multiple lendings. The major MFIs claim that they follow a voluntary code of conduct to ensure borrower protection, but evidence from the ground suggests a failure. It is time to revisit the fundamentals of reaching credit to the poor and strengthen the tenets of SHG-based lending. The process may be slow, but it is not suicidal. For Micro-Finance survival, they need to muzzle their Spin Doctors and listen more to their High Priest A string of suicides in Andhra Pradesh that put micro-finance under the spotlight, triggered a backlash because of which, MFIs found themselves reduced to fighting for their basic survival. No surprise here to find a variety of spin-doctors functioning as their apologists, fending off and neutralising any criticism that the industry faces currently, almost oblivion to the fact their support is to a slow sinking Titanic. Two of the most significant spins in this debate are those related to suicides and interest rate. In this post, we bust these spins. "I believe in Schumpeterian creative destruction. Its time has come. The present MFI model has to go.... It wasn't just about giving loans. It was also about creating livelihood mechanisms, which would build capacity among the poor to repay their loans easily, and leave them better off than before" This is Economic Times quoting Vijay Mahajan, considered the high priest of Indian microfinance suggesting that either MFIs change their business models or go bust. The only problem with MFIs is that there are many MFIs working at any given place thereby each providing easy loan to people who believe that running a small enterprise/shop is easy. Its only multiple lending that has made the situation so horrible. I believe a simple regulation on the part of government would be enough to make MFIs sensible and stick to agenda of providing credit to poor people at interest rates at around 20% even if for MFIs it means shelving scaling up opportunities and making investors a little less happy. The recession is supposed to be over, but customer lending - or loans lent to individuals - is still low. Most of us have depend on lenders when it comes to financial assistance. Some find it easy to get short term financial aid, but others are unfortunate to take out. Customer lending - loans lent to individuals - has been slow to recuperate from a two-year lull. Loans such as mortgages, auto loans, home equity lines of credit and personal loans aren’t extremely hard to get but are harder to get approved for. Since the banking and finance industry had to run for cover after going on several years of a glut, loan providers have become more skittish.